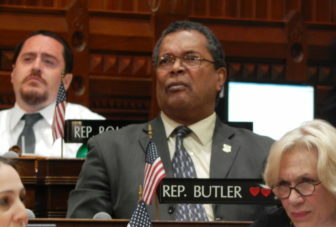 Rep. Larry Butler, D-Waterbury, one of the bill’s proponents, reacts as the narrow vote tally is displayed in the House chamber. There were audible gasps in the chamber. The General Assembly dealt a blow to Gov. Dannel P. Malloy’s housing agenda Monday after legislators voted narrowly to override his veto of a bill that loosens the state’s affordable housing standards. Both the House and Senate mustered the two-thirds majorities necessary to override. The margin in the Senate, 24-12, could not have been narrower. The House voted by a 101-47 margin. Three members – two Democrats and one Republican – were absent and did not vote. It marks just the fourth time the legislature has overridden one of the governor’s vetoes. The first three came last year. Legislators spent hours debating the override in both chambers, with clashes between competing Democratic factions dominating much of the time. The Democratic divide fell largely along urban and non-urban lines. The bill’s proponents argued lowering affordable housing benchmarks would incentivize new development, while those opposed said it would have the opposite effect. It drew strong support from suburban and rural legislators in both parties. It also received support from a handful of urban legislators who said it had its drawbacks, but represented a compromise. In the General Assembly’s vote during the regular session, the bill received wide bipartisan support, passing the House 116-33 and the Senate 30-6. Chris Collibee, a spokesman for the governor, said the state’s “residents and communities were not served by” the override vote. “Make no mistake, Gov. Malloy is undeterred by today’s developments and remains resolute in increasing access to affordable housing in all of our communities, because every person – regardless of race, ethnicity or socio-economic status – deserves the opportunity to live in the communities in which they work,” Collibee said. The legislation modifies the state’s 8-30g law, which pushes – but does not require – all municipalities to have 10 percent of their housing stock deemed affordable. Thirty-one municipalities have reached that threshold. House Speaker Joe Aresimowicz, left, and House Majority Leader Matt Ritter outside the House chamber Monday. They came down on opposite sides of Monday’s vote. In the 138 municipalities with less than 10 percent, developers are allowed to bypass local zoning laws if they are building affordable units. The bill’s proponents have said “predatory developers” are taking advantage of this provision by including a handful of affordable housing units in larger, unrelated development projects. Municipalities can temporarily halt unrestricted development by earning moratoriums, each of which lasts for four years. Cities and towns can earn one by increasing their affordable housing stock by 2 percentage points or by earning “points” for the units that have been built. Three municipalities – Darien, New Canaan and Brookfield – have qualified for moratoriums this year. While the 10 percent affordable threshold is maintained in the bill, it is now easier for municipalities to reach moratoriums – and for some, the moratoriums are now longer. Smaller towns can earn 33 percent fewer points and still qualify for a moratorium under the new law. Those points have become easier to earn as well, with more housing units now designated as affordable, and some units being worth more points. In the state’s six mid-size cities, each with more than 20,000 housing units, reaching a moratorium now only requires a 1.5 percentage-point increase in the affordable housing stock. And the second and subsequent moratoriums last five years. It also contains a provision that designates the Ryder Woods mobile home park in Milford as affordable housing units. Rep. Larry Butler, D-Waterbury, another co-chair, said enacting this legislation takes the blame off the state and put the onus on municipalities to prove they are serious about affordable housing. “This disproportionate power given to developers has not helped Connecticut grow our affordable housing stock, and we are putting an end to it today,” said Sen. Gayle Slossberg, D-Milford, the third committee co-chair and one of the bill’s leading proponents. About two-thirds of Democrats in both chambers voted against the override. The split within the Democratic Party largely fell along urban and non-urban lines, reaching all the way to the top of the party’s leadership. 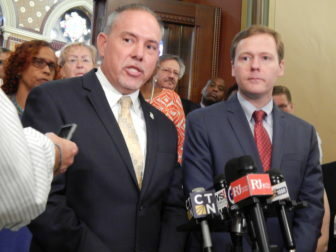 House Speaker Joe Aresimowicz, D-Berlin, and House Majority Leader Matt Ritter, D-Hartford, came down on different sides of the vote, as did Senate President Pro Tem Martin M. Looney, D-New Haven, and Senate Majority Leader Bob Duff, D-Norwalk. Aresimowicz and Duff supported the override. Looney and Ritter opposed it. Aresimowicz said the bill only makes “slight changes” to the 8-30g law without altering its goal of increasing affordable housing across the state. Rep. Jonathan Steinberg, D-Westport, said communities need to believe a moratorium is within reach, which he said is not the case under the existing 8-30g provisions. Steinberg said he plans to take an unwavering message to his town’s leaders – act. 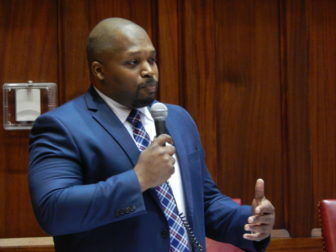 Sen. Gary Winfield, who initially supported the bill, announces his opposition to the veto override on the floor Monday evening. Still, many Democratic representatives from the state’s cities railed against the bill, saying now is not the time to halt the push for more affordable housing. Sen. Gary Winfield, D-New Haven, had supported the bill during the regular session, but said he was “teetering” at the time. Now, with the governor’s opposition clear, he said he could no longer support it. “I can’t bring myself to do something that I see as potentially – and I’m not suggesting that it necessarily does – but potentially limiting opportunities for people,” Winfield said. Among Republicans, the message was simple: Municipalities looking to plan and zone effectively need to have more say. “Towns like mine just wanted a fighting chance to be able to build affordable housing without having predatory developers breathing down our necks, building massive amounts of units and only giving just a few small units to affordable housing,” said Rep. Brenda Kupchick, R-Fairfield, ranking member on the Housing Committee. Only two Republicans opposed the override: Sen. George Logan, R-Ansonia, and Sen. Len Suzio, R-Meriden. Logan voted for the bill during the regular session, while Suzio voted against it. The governor vetoed four bills this year, two of which generated some discussion before Monday’s override vote. Ultimately, the legislature only took up the affordable housing bill. Another bill would have allowed Bridgeport to create a thermal heating loop subsidized by the city’s ratepayers. Malloy vetoed it because the heating system would not have been under the oversight of the Public Utilities Regulatory Authority. Aresimowicz said legislators will explore ways to address the governor’s concerns and find another avenue to advance the bill this year. Correction: A previous version of this article incorrectly stated Sen. George Logan was the only Republican to vote against the override. Sen. Len Suzio voted against it as well. Kyle Constable Kyle was a general assignment reporter at the Connecticut Mirror. A former State Capitol beat writer for The Daily Campus, he graduated from UConn with a bachelor's degree in journalism in 2017. He previously worked for the Mirror as a freelance reporter and, before that, was the Mirror's 2016 summer reporting fellow and an intern during the 2016 legislative session.